Kerala has a great culture that has been contributed by the people and different races. The history of Kerala can tell about the process of culture synthesis. Throughout the ages, Kerala has proved that it can respond to any challenges through its adaptation and combination of old traditions. The people of Kerala have got an honor among those who have achieved Indian cultural heritage. The culture of Kerala is a part of Indian culture. Kerala’s culture has persisted due to the reasons of unity, continuity and universality. It gives importance to the human achievements in any fields like religion, philosophy, language, art, education and social organization. The cultural heritage of Kerala can be seen from the different art forms and customs of Kerala. The landlords of earlier times encouraged these arts and culture together with holding the moral values of it. A significance of art of Kerala is the special visual effects and good music. Kerala can boast of its performing arts proudly. There is no other state in India which can match up with the creativity of arts of Kerala. The people of Kerala lead a simple life and are culturally inclined and traditional and celebrate the festivals well. The traditional costumes of Keralites are mundu and neriyathu. The culture of Kerala is a part of both Indian and Dravidian culture. Even then there is some part that has its own flavor. The culture of Kerala was expanded with the influence of neighboring areas as well. The main religion in Kerala is Hinduism even though there are people following Christianity and Islam. The language, dress, organizations and culture of Kerala are distinct. It is interesting to note that there is a similarity in the language and customs of Kerala to that of the Mediterranean civilization, Egyptian civilization and the Indus valley civilization. It is believed that the Dravidas has inhabited the western part of India by making Madurai as their capital. In the songs called as Vadakkan Pattu it is mentioned that the Ezhavas had arrived to Kerala from Ezham which is the present day Sri Lanka. The region which is now called as Kerala was developed at a very late stage and the culture also was developed slowly. The southern part of India was ruled by the Cheras, Cholas and the Pandyas. There were fights among them for the rule over different areas and it was the Cholas who was successful in ruling the whole of Kerala. After that many local rulers emerged and then there were the coming of the outsiders as well. The language of Kerala, Malayalam was developed during that period. There is a great influence of the Sanskrit language over Malayalam. Ayurveda also started to develop in Kerala at that time. Even though Kerala is a small strip of land in terms of geographic location, it is possible for one to find a huge number of different parts of cultural heritage. 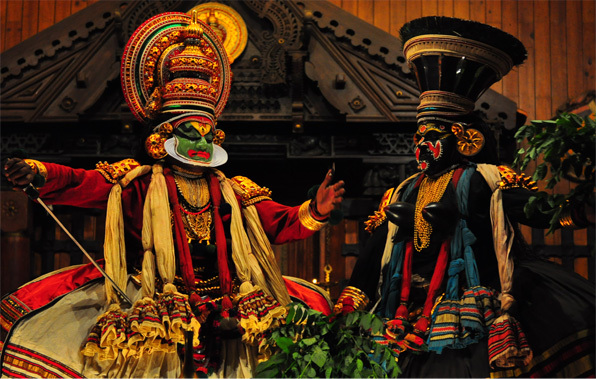 The culture of Kerala can be seen from the arts, cuisines and dance forms of Kerala.